Women: for the ones that desire to, we are born to instinctively create new lives thanks to our bodies that know exactly how to do so. One morning you wake up next to a tiny little human being that you created for 9 months with joy, fear, prudence, excitement and hope. isn’t it just beautiful? it’s a lot of work too…From postpartum to getting mom friends, motherhood is definitely more than a lifestyle. Is it though? I’m not ashamed to say that it’s not, and that’s okay. Mothers are expected to be ecstatic and muses of motherhood but being the perfect mom is a myth and a lot of pressure on one person to take on. We may have all the books in the world that our parents didn’t have but that still doesn’t take away the fact that being a new mother is something that takes over with countless changes and doubts. No books will completely ease the apprenticeship of motherhood..We learn as we go, we fail, we find rewards and we deeply love like never before. Postpartum is probably the most challenging period of my life this far. Postpartum combines all emotional, hormonal and physical aspects of your self that has changed. A lot of women are ashamed to talk about it and it’s sad. I see Instagram posts of mothers apologizing for pouring their hearts out because of the challenges they are facing as they are naturally overwhelmed. There is so many different postpartum: depression, anxiety, weight gain…These are real issues that mothers go through. Here’s an amazing article, click here. to learn more about postpartum depression and anxiety and how to get help. This actually goes back to man-cave days where some women bodies retain the fat to ensure to be able to feed their babies! like me! hey girl hey! – If you think about it, it’s quite amazing! but oh, so frustrating. So, if someone guaranteed you that breastfeeding will make you lose weight; it’s not true and depends on how your body reacts to it. I did all the tests, thyroid, hormonal…and my progesterone is still really high. what it means is that my body thinks that I’m still feeding my baby even though I was done breastfeeding about three months ago. What it also means is that it can take up to 6 months to a year in a half for me to shed the weight. why am I telling you this? because this is what happens for most women! this is reality! I’m so sick and tired of people looking at me like I’m doing something wrong. “well, what are you eating?” “do you exercise?” “you must not be healthy for this to be happening.” I’ve heard it all and it’s hard enough to look at yourself in the mirror with 30 extra pounds to the point where you’re unsure of who you are. It’s hard enough to deal with all the possible changes of your daily life. Of course it’s for the biggest reward, but that doesn’t mean that as mothers we can’t go through things. My point is, no I’m not doing anything wrong and at this moment I’ve tried a lot of things with no results. The real attempt that I should be focusing on? Patience. And that a lot of people don’t even know what that is, in meantime you get shamed for being some kind of creature failing at this motherhood thing. I still remember before I had a kid, I’d hear people say “I mean she had a kid a year ago and she’s still pretty big! I’m sure she just let herself go!” – Not only did I never liked these kind of statements but more than ever now. Respect different healings, different bodies, different women. there’s no “real” pregnancies, postpartum or parenting. They’re all just different. But if we could all shed some light on all of them collectively, not only would we educate ourselves and probably be less shallow. Stretch marks, sluggy tummy and cellulite don’t have to be ugly! They’re normal! it doesn’t mean that I’m ready to snap a picture of my body tomorrow but at least I’m letting myself know and other women going through this, that you’re beautiful! not every day do I see myself as beautiful but trying is already halfway the battle! The body needs at least 8 hours of sleep, I hadn’t had a full night of sleep since the last three months of my pregnancy. somehow the body gets to used it but now that Oliver is a little older, I’m really trying to take care of myself when I can, go to bed early when my body tells me to and I’m attentive to my needs, admitting that it’s okay if I’ll be napping instead of taking care of a pile of dirty dishes. Taking quick naps, even if it was for 15 minutes, just laying down and closing your eyes or meditating can do wonders. Everyone says “sleep when your baby sleeps” and honestly, especially for the first few months, it’s key! but I had moments when Oliver would fall asleep in the stroller at the grocery store and even though I considered getting cozy in the diaper aisle, it wasn’t appropriate. My needs are definitely half met now that I have Oliver, but I also realized that a lot of things I thought I “needed” before being a mom are now a joke. It’s temporary, it gets better and definitely easier with support and understanding from your partner, friends, parents, anyone really. 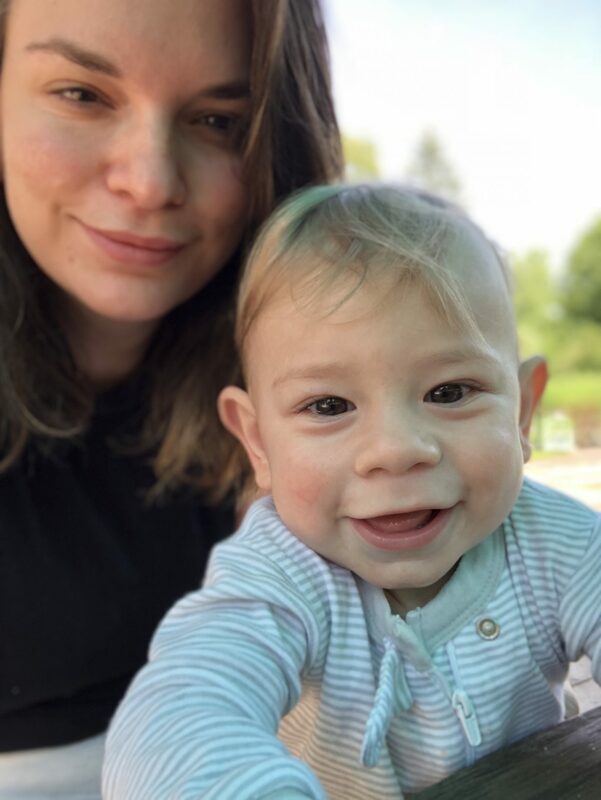 Only the past month has Oliver been sleeping through the night (it’s a hit or miss) but he’s now 10 months…So it gives you an idea of how long I’ve been craving to just sleep without waking up once. When Oliver was born, I was showered with Do’s and Don’ts. I realized with time and trying different things that some of it didn’t apply to me or Oliver. All babies are different! some cultures are different! some moms are different! I allowed myself to believe that it wouldn’t make me a good or bad mother if I simply did what I wanted to do for Oliver and what seemed to work for him! Here’s an example: Some babies enjoy being swaddled, for some its a must. I literally killed myself swaddling Oliver because everyone was telling me how important it was, “don’t let his arms out!” Yet he was screaming every time and people would tell me its normal and yet I still wouldn’t be able to sleep because my baby seemed to hate being swaddled! Some babies have no problem sleeping in a bassinet, while others won’t. Period. It’s easy for others to look at you and think, “gee, you’re a mess. Get a massage or something.” While that’s very thoughtful *sigh*, getting away for a few hours is not always the easiest thing to do depending on the scenario. if you have grandparents or comfortable right away with a baby sitter…that’s awesome! we don’t all have that and in that case, it takes time. No one said your life will go back to exactly how it was after a kid, I don’t know why I was expected to look or be the same after a newborn…give a momma a break! No one really talks about how hard it becomes to be a partner and a mom Or how it is to become a dad! Father’s Day coming up and did you know that a lot of men can also experience postpartum depression? a friend of mine posted that it has risen to 65% of the first 5 years their kid’s life. It’s hard for both parents to adjust. I think that communication really helped Kyle and I but there’s still an adjustment period where you have to individually exercise your new parenting role and also find a rhythm parenting together. I think that there was definitely a period of loneliness and misunderstanding, mistakes but also the most beautiful moments as partners being new parents completely obsessed with their child. you’ll quickly see that your new schedule definitely doesn’t fit with your “old life.” You’ll quickly see some friends stick around, while others just text a couple sweet words and a “you look exhausted!” once in a while. I think that’s just how life and recycling works. It’s been hard for me to adapt one y own but also figure out how to include my friends and explain that it’s a “whenever I want to hang” scenario anymore; Loyal friends get it and will adapt as well. It’s learning process on both sides. It’s also been a challenge for me to include myself in “mom groups”, not only is it not that easy to find, but you also have to make time for it and at the beginning it’s hard with a new baby! just getting out of the house is intimidating in its own ways! I’m also traveling a lot which doesn’t call for consistency and you sometimes lose track of good habits or people just move on. The mom friend world is something I’m still trying to navigate, there’s some type of segregation that happens where if your kid doesn’t walk yet or whatever it might be…there’s that “you can’t sit with us” type of mentality that I’ve been experiencing. As everything takes time and I’m learning the ropes, everything gets better and makes sense with time. This is definitely an opportunity to meet new people and make new friendships. It’s just a matter of getting back to those skills and knowing where to go! so while your kid makes new friends, so do you! I heard that the peanut app is actually amazing and I’ll be trying it out! it’s a way to meet new moms near you! I guess moms can also swipe left or right! haha! oh boy!